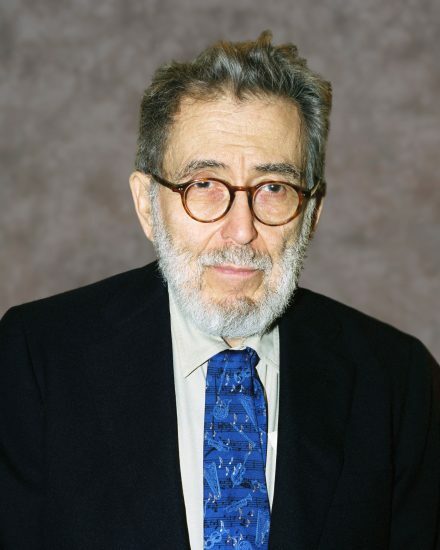 I met Nat Hentoff at the 1997 conference of the International Association for Jazz Education, on an interview panel hosted by jazz DJ Steve Schwartz. At that time Nat had been on a hiatus of sorts from jazz writing, but after the session he told me he’d really like to get back into it. Shortly thereafter he came onboard at JT as the magazine’s back-page columnist, and he continued to write his “Final Chorus” for the next 14 years. His first piece was on the Reverend John Gensel and the jazz ministry he created with Duke Ellington at Saint Peter’s Church. Perhaps it’s no coincidence that his last contribution was about a young-adult novel on Duke. Even though my job title was and is publisher, I was Nat’s personal typist, because he refused to use e-mail. He’d fax his typewritten column, replete with handwritten corrections like hieroglyphics, but I rarely complained, because you can learn a lot about a writer’s style by retyping his or her work. Nat’s style was clear as day—direct and plainspoken and not the least bit florid. He wrote like he talked. At one point I referred to Nat as a primary source for jazz history, because of his personal relationships with so many of the legends of jazz, including Ellington, Mingus, Coltrane and Miles, and lesser-known figures like Frankie Newton and Ruby Braff. Nat was very touched by that observation. “That meant a lot,” he said. “One of the advantages of longevity, or of being alive, is that I was able to know them and to continue writing about them.” Indeed, there are few jazz writers left with that capability. Nat may not have considered himself a critic, but he certainly wasn’t afraid to be critical, whether it was questioning the jazz credibility of Jane Monheit and Diana Krall or attacking his own employer at JazzTimes for promoting jazz trips to Cuba. Unlike most opinionated people, Nat had thick skin and didn’t mind getting negative feedback. I’d even say he reveled in the blowback, as he demonstrated throughout his long career as a social and political columnist. One of his paradoxical quirks was that he insisted on running his phone number at the end of every column. I use “paradoxical” because many times he would answer the phone and bark at the caller that he was busy—say, on deadline saving the country from John Ashcroft—and clack would go the receiver. Callers weren’t sure what to do after that. Some called back and got the softer Nat. Many gave up. Nat and I talked a lot over the years and became very close. I still have the audio of some of his memorable voicemail messages, including those in which he berated me or the magazine and those in which he praised us. They were simply two sides of the same very opinionated coin. He relied on me for contacts in the jazz community, because he didn’t get out much in his later years. And he read the magazine cover to cover, commenting on this piece or that writer. He was remarkably generous toward other writers, asking for contact information for an author of an article he admired, and recommending writers to the publishers of his books. He didn’t seem to show that competitive edge that many writers have toward their colleagues. Common to many of us as we get older, he was partial to stories about young people, in his case those who were engaged in learning, playing or promoting jazz. He was always looking for stories with heart and impact. He was fixated on the work of the Jazz Foundation of America, and on its efforts to provide healthcare and support to aging jazz musicians. He wrote about that organization more than any other subject, to the point where we had to ask him to move on. Needless to say, he didn’t like being told what to do or what to say, unless he asked for it. He’d say to me, “Like Popeye said, ‘I yam what I yam.’” That meant, “Leave me the hell alone.” I don’t think I’ll ever forget his sonorous voice, which I will always associate with a generous spirit and relentless conviction. Read Lee Mergner’s 2010 interview with Nat Hentoff.